Some of the design features you will notice are the black rings around the magnets and the black strip along the back. Theses are not there because they are DeWalt colors, they are actually a material that prevents the magnets from slipping when attached to smooth metal surfaces. We all know that magnets will slide when under load and these simple additions to the case solve that problem. Even when I had the case completely loaded with drill bits, it did not slip. 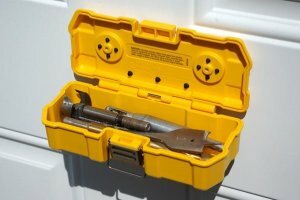 You can use the magnets to attach the case to your toolbox or work cart, but there are so many more options. How about attaching it to a metal door while you install the door hardware. You could even attach it to the rails of a man lift and have quick access to additional tools. Another feature I noticed was the matching tongue and groove along the edges where the case lid meets the case body. 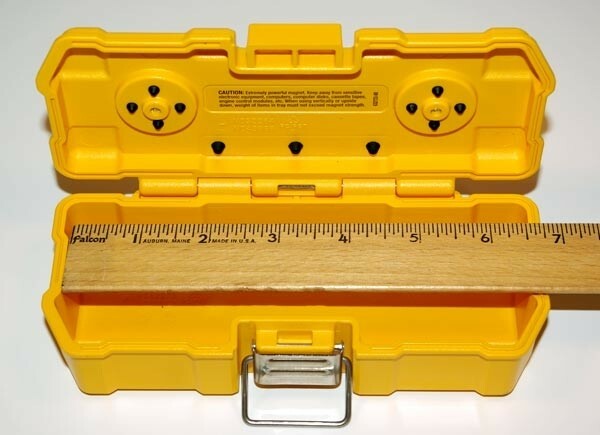 Anyone with a drill case knows that if the edges do not align exactly, the case will not close correctly and will sometime come unlatched. This tongue & groove also goes one step further and prevents the lid from shifting during hard impacts. In many cases a hard impact would cause the lid to pop open. Testing the durability of the case was half the fun. After the dog ignored my attempts to play fetch with the ToughCase, I decided to just throw the case around the yard anyway. It passed the 20 foot throw test fully loaded, and also a couple rounds of yard bowling. During all of these attempts the lid never once opened up, and the latch remained secure. 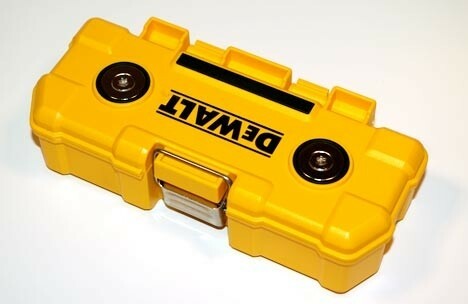 It looks like DeWalt spent some time thinking and planning the design of the case because it shows. DeWalt even included a row of hooks along the back that allow the box to hang on the lips of some thinner materials. Look for the DeWalt ToughCase in a 15-piece (DWMTC15) fastening set or 20-piece (DWMTCIR20) Impact Ready set in your local hardware store starting at around $20. Want a tough case of your own for free? Check back at Tool-Rank tomorrow for details.